Thailand is one of the most popular destinations not only for Muslims but also non-Muslims alike. It is a perfect destination for those Muslims looking for a Muslim friendly honeymoon destination. Thailand has some amazing beaches and sceneries and no wonder it comes to mind when looking for honeymoon destinations. If you are wondering what is there to visit away from the busy streets of Bangkok just to relax and unwind then these 4 amazing destinations within Thailand are perfect for you. Renowned for being the largest island in Thailand, Phuket offers plenty of activities for all kinds of travellers, including honeymooners and luxury travellers. It is also a hundred destination in one! Regardless of what you are looking for, be it romance, luxury or serenity that an island has to offer, Phuket is the place to be. For couples who love nightlife entertainment and always seeking something spectacular to do, head to the beautiful town of Patong. It is a place to experience non-stop, fun filled actions as there is plenty of shopping and partying opportunities for you. Other regions in Phuket that’s also a haven for honeymooners and couples looking for a perfect romantic getaway include the beautiful enclaves of Surin and Kamala. These beautiful destinations is a place to find romantic luxury resorts, exotic restaurants, incredible beach clubs and a friendly atmosphere. Phuket is blessed with pristine beaches and palm fringe coastlines, making it an ideal spot for couples planning their honeymoon vacation in Thailand. There are some amazing and very cheap hotels in Phuket making this very attractive for a low cost luxury honeymoon. There are 3,200 hotels in Phuket so the options can be confusing and complicated. Here are my top 3 which can help you have fun without breaking the bank. The hotels from Tripadvisor here. 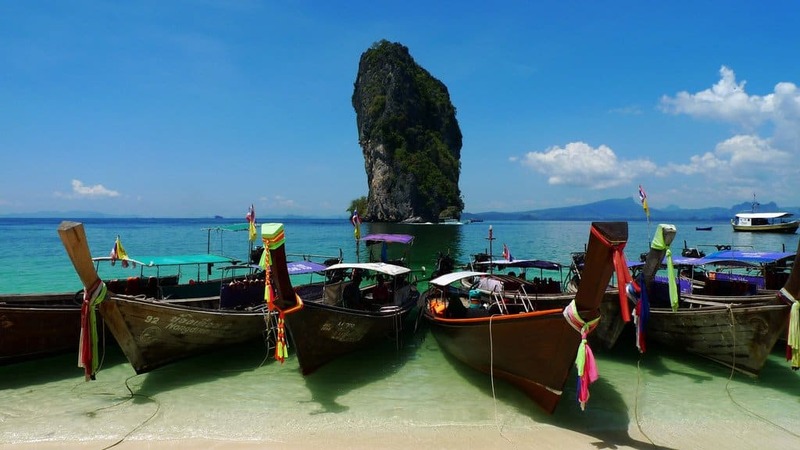 Krabi is one of the best places to visit in Thailand for honeymooners seeking a romantic getaway. Though less popular than Phuket, this mainland beach is a wonderful place to use as a starting point if you want to explore other islands in Andanman Bay including Phuket and Phi Phi. The crystal clear waters, serene atmosphere and dramatic cliffs all makes Krabi an amazing destination for honeymooners. This island is one of the most beautiful Thai island destination that attracts people from all over the world. If you are a beach-loving couple seeking for a cool place to unwind and relax, you will without a doubt be at home at Krabi. 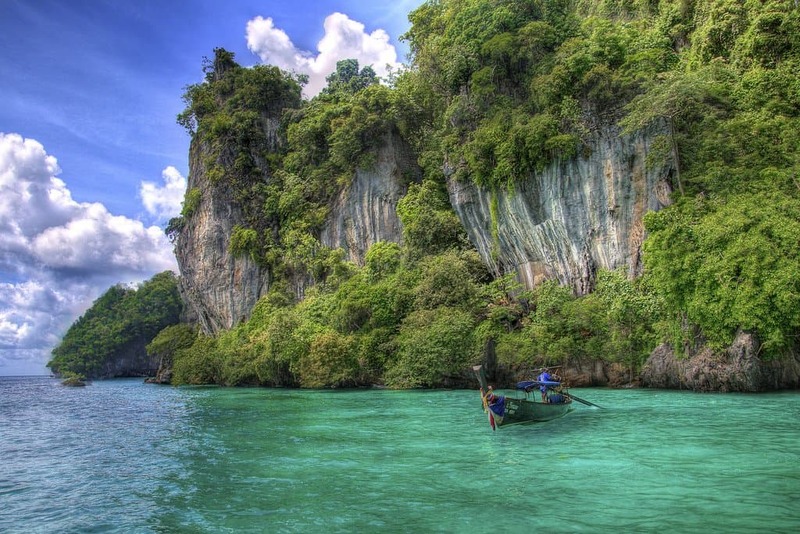 I have been eyeing up Krabi for some time. It has some amazing scenery and magnificent views, also the hotels in Krabi are so affordable it is crazy. You can check out all hotels here. Koh Samui has been on my list to visit for ever. 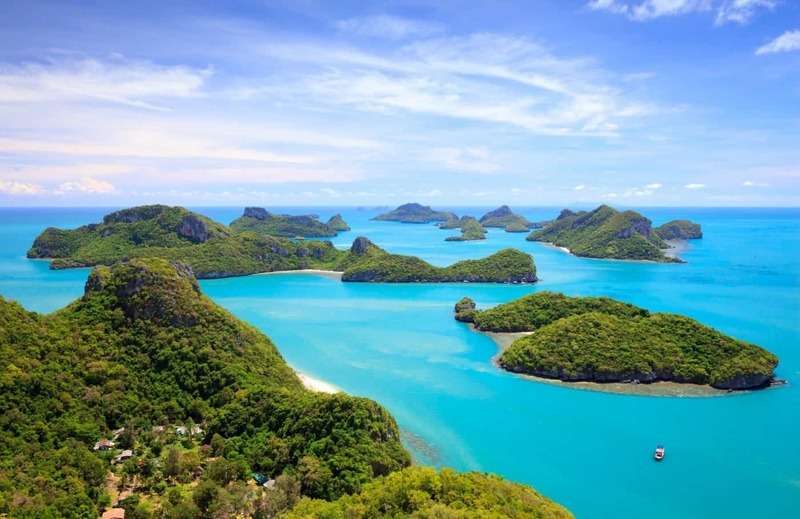 If you’d like to visit a spectacular destination that has everything on offer while planning your honeymoon or romantic getaway in Thailand, check out Koh Samui. Located in the southeastern region of Thailand, Koh Samui is now considered a haven for tourists especially honeymooners and couples seeking luxury and romance. There are plenty of quality luxury hotel brands that offers great hospitality. You will find plenty of pristine beaches and world class restaurants, so there’s no shortage of things to do and places to see. If you are seeking a romantic honeymoon destination where you can spend exotic honeymoon and also party all night long, head to Koh Samui. Thailand is not all about beaches, they do have some amazing mountains and places like Chiang Mai. A favourite destination among local visitors and tourist alike. It has charming boutiques, lively atmosphere, ancient temples, and outstanding attractions that make Chiang Mai a great place for those planning a romantic break. There are plenty of outdoor activities to enjoy including hiking, river rafting and elephant rides. For honeymooners and couples who want to indulge, Chiang Mai is home to world class luxury resorts where guest can experience comfort and hospitality at its best. The city is blessed with tribal villages and lush mountains worth exploring. Flights from Europe and the US recently have been extremely cheap. Prices start from £300 or $500 in some instances to visit. There are many cheap flights that you can take from Bangkok and Kuala Lumpur starting from as little as £10. You can search for all the availability and options on Skyscanner here. If you want to see the best way to use SkyScanner for finding cheap flights around the world you can watch my video training here. #MTG TIP Don’t try to book flights directly to these destinations. Usually booking a flight directly to Phuket will be more expensive than booking the same flight to Bangkok and then finding a low-cost option from Bangkok to the destination you want. Plus you also get to explore Bangkok or Kuala Lumpur. Been looking at holiday options to Thailand at the moment, so this post is brilliantmy timed! Would you recommend using a package deal over arranging everything yourself? I personally love putting the trips together myself, but there is always the risk of picking hotels that might not be that great, or areas that are not ideal. Is the hotel recommended serve halal breakfast? The hotels do offer halal but check in advance for the options.